As a fat used for cooking, butter provides a unique flavor and aroma to many dishes. The problem with butter is that before you get to its smoke point, the milk solids have gone past browning to burning. Removing the milk solids and impurities allows us to retain much of the flavor of butter while being able to cook at higher temperatures. Butter without milk solids is called clarified butter or drawn butter (although some restaurants serve just melted butter as drawn butter). The process (clarifying butter) is quite simple. 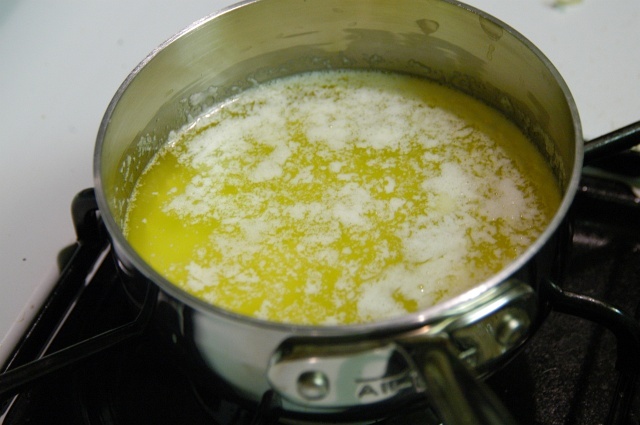 Clarifying butter is as simple as melting butter and letting the milk solids settle or rise out of the fat. Care should be taken not to burn the butter while heating it, so use a heavy pan that doesn't have any hotspots (see Common Materials of Cookware for more information on hotspots). When using salted butter, it is difficult to guess how much salt will remain in the clarified butter. A lot of the salt can be found in the milk solids as it settles or foams up, but the exact amount will be different every time. Use unsalted butter to remove any uncertainty (you can add salt to the clarified butter later to achieve the desired saltiness). To make approximately 3/4 cup of clarified butter, melt one cup (225 g) of butter in a small saucepan (a 1-quart saucepan is shown in the picture) over low heat. With a good saucepan, you can just leave it there over low heat while doing something else and the butter will slowly melt. Turning up the heat will melt the butter faster, but the milk solids may begin to burn, so, resist the temptation. Instead, you can cut up the butter into pieces to speed up melting. Also, if you don't have a small saucepan, it may be best to use more butter. 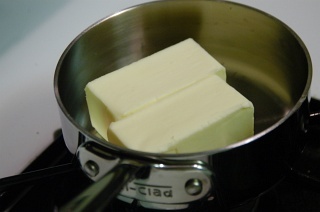 Too little butter in a large diameter pan will make it difficult to separate the solids from the fat later. At this point you can remove the butter from the heat and skim off all the foam. Let the butter cool a bit to let more of the solids settle and then pour or spoon out the clarified fat, leaving the remaining milk solids in the pan. Alternatively, pour the hot melted butter through cheesecloth to filter out the foam and solids that have settled, catching the clarified butter in a jar. Or, pour the hot butter into a container, allow it to separate while cooling and then refrigerate. After it has solidified, you can easily scrape off the hardened foam from the stiff clarified butter layer. Although pure clarified butter does not need to be refrigeration, I recommend you store your clarified butter in the refrigerator (some milk solids may still be present and may cause the butter to go rancid). Use the clarified butter as you would use regular butter (tablespoon for tablespoon) in recipes. I've used Alton Brown's method (http://www.foodnetwork.com/food/recipes/recipe/0,,FOOD_9936_22742,00.html) in the past, and it has worked quite well. The best part is there's no straining if you do it right. Just make sure to follow the recipe exactly. What is the difference between Ghee & Clarified butter? The best part is there's no straining if you do it right. Just make sure to follow the recipe exactly. You would still need to get rid of the solids somehow. 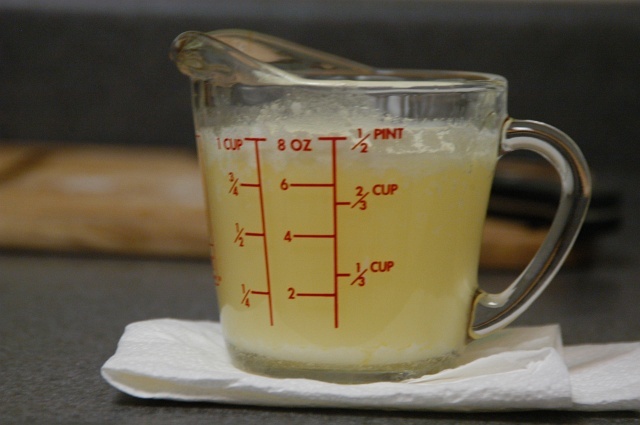 Ghee and Clarified Butter are used interchangeably. You usually hear it referred to as Ghee in indian dishes and Clarified Butter in western dishes. Traditionally ghee is made with milk (buffalo and sometimes cow) that has been allowed to develop some sourness before churning into butter. This provides more flavor to the butter. The butter is then melted and water completely cooked off. Many recipes for clarified butter do not call for the complete evaporation of water in the butter. So, I would say that ghee is a type of clarified butter, but not all clarified butter is ghee. P.S I enjoy your Blog very much. Using a Gravy or Fat Separator makes the skimming part go much easier. hey, long time fan..first post here. when i make ghee from sticks of store bought butter(unsalted only), i simply let it melt over the low to medium heat. i use sound as the indicator for doneness. when it stops making the sound, i take it off the heat. i also skim the top..the foam, although i know that many people dont do that. if i want the butter to be more like beurre noisette, i let it brown or better still, i drop the sticks of butter when the pan is really really hot. the colour can vary from a milky white to a golden brown..and when overdone, a dark brown. i have never heard of the sourness factor in traditional ghee. it might be true. i have also made ghee from the butter i churned from the cream. for a short time, a milkman used to stop by and deliver the milk straight from the udder. (btw, watching someone milk a cow is *fascinating*) after boiling it, i'd let it cool down. after it cools down, there will be a layer of cream. this, i deposit in a little container for about two weeks. after i have collected enough, the cream can be churned to seperate the whey and the butter. the seperated butter goes through the same process as the above method of making ghee from store bought sticks of butter. i prefer buffalo milk which has more fat than cow's milk. the butter from the former is slightly yellow while the butter from the cow is 'white'. to his version of Ghee. My understanding of curry is that it is made up of various spices which can change from person to person. i.e. that there are many different curry recipes. I've never heard of curry leaves. Can someone elaborate. Trading meal preps with an Indian family can expand "spice horizons" past anything that Christopher Columbus ever had in mind. Just make friends with the local Indian grocer and a network can evolve. Get ready to eat with your scooped hand. The term "curry", as we americans relate to it from the yellow 4 ounce metal tin named "curry powder", is a result of the British returning from India and wanting to duplicate an "average" of the spicy dishes they had experienced. Try here: http://redhotcurry.com/entertainment/books/sbasu1.htm . There are lots of web refs to expand the story. The 4 ounce can is one of many possible garam masalas. Note that the WORD in many languages is the phonetic "ka-ree". Thus, the sun-besotted Brits easily confused the issue, importing a wonderful product (a canned garam masala) with a cross-linked name. Thank you jimjimjim9 for your post. It is extemely informative. Very nice work. sorry i missed your question, Michael. what jimjimjim9 says..
thanks, jimjimjim9. i couldnt have said it better. very informative. According to Alton Brown, butter that's been heated until the milk sugars caramelize is ghee. (Heat it over medium until it foams a second time, and when the foam subsides, let it cool, then strain it.) I don't know how accurate this is, but I know that it's also called "beurre noisette", and I know that it tastes and smells way better than plain ol' clarified so long as it is not over-burnt. When enhanced with a bit of fine sea salt, it's awsome on butter, makes better baklava, etc. etc. I've tried many methods of making clarified butter, including Alton Brown's, and the old fashioned labor intensive melt and skim routine, but I've recently discovered a far superior method of making clarified butter. It's superior because it is not only less labor intensive, but it removes the milk solids much more completely, and wastes much less of the milkfat that is otherwise wasted when skimming off foam and trying to separate the milkfat from the water. Here's how I do it: I cut up butter and melt it in a saucepot, but I keep it on the heat until all the water boils off and the milk solids start to dry and clump together. (I don't mean to gross anyone out, but at the stage I'm talking about, the milk solids look like flaky ear wax.) Stop the heat at this point if you just want plain old clarified butter; if you keep heating it, the milk sugars will caramelize, and you'll have beurre noisette, which is good but not suitable for some applications requiring clarified butter. Then, I let it sit and cool until it is less than 200 degrees Fahrenheit. (So it won't melt the plastic on my super fine wire mesh coffee filter.) Once it's cool, I pour it all through one of those super fine wire mesh coffee filters arranged over a jar or some other storage vessel, and scrape all the solids from the pot into the filter so the fat can drip out. The benefits of this method include saved labor, and unlike Alton Brown's method, this method removes the milk solids much more completely. Curry Leaves can be bought at any indian grocery. It's also known as Sweet Curry Leaf. It is a very special flavor. I love it. The leaves can also be frozen I hear. The hare krishna cookbook "A Higher Taste" has a very detailed description on how to make ghee. As for how long it keeps, I made some 8 months ago and have kept it in the fridge and its still good. Just remember to always use a clean spoon to scoop it out. Oh and store it in glass. Coincidentally, I just put up a blog post about curry leaves and the origin of the "curry powder" spice blend. The short story: curry leaves are from the Murraya koenigii tree, known as kari-pak in Tamil. according to the Historical Dictionary of Indian Food, by Achaya. He says that curry is "[f]rom the Tamil word kari, a term for black pepper...the term originally denoted any spiced dish that accompanied south Indian food, and was first so referred to...as early as in AD 1502"
I used to work in a restaurant, and there I learned a trick for making clarified butter quickly. Melt your butter in the microwave in a square container, let it settle a bit, and skim the top. Then pour the fat off the top over one of the flat sides. This allows you to pour more fat off before you start to pour milk solids as well. You'll still have to spoon some off, throw some out, or do some straining, but if you're in a hurry and you're willing to waste a little fat (as is nearly always the case in a restaurant setting) this is a great trick. Hopefully this isn't a silly newbie question: How does clarifying the butter change it's nutritional value? Wouldn't souring the milk correspond more-or-less exactly with culturing of milk traditionally done for butter in Western cuisine? If so, you could duplicate the effect by getting "cultured butter" and making your ghee of that. somebody write in spanish, this proceed, i don�t understand everything. I have always had a great deal of success simply melting butter in a coffee cup in a microwave, and then spilling off the clarified portion through a tablespoon resting against the inside of the cup. The time in the microwave is only a few seconds, and the qty produced is usually sufficient for whatever recipe you're working on. This is a perfect alternative to no-stick "Pam" or whatever. Works wonders for omelets etc. Someone asked about Ghee...I believe the difference is that ghee is heated to a point of fragrance sometime after melting but before caramelization. I think it's heated more. We should ask our Indian friends. I don't want to burn the butter - can I make this in a double boiler (sp?) instead? Does it need to burn? You can make it in a double boiler. Some people like the taste of lightly heated Ghee or clarified butter and some like the flavor of butter that has been heated (cooked) to a higher temperature before filtering. No, they aren't. Guest John is correct about what he said. Ghee is clarified butter that has been further heated and cooked until it has a more nutty flavor and is slightly darker in color. Ghee uses the old 'Maillard reaction' to produce flavours from the milk proteins and lactose in the butter. The oil-liking flavours (nutty/roasted) are then extracted into the fat that remains to form the flavoured ghee. Subject: Does making ghee "burn off" cholesterol? I know that sounds like an odd question. But having worked as a chef for over 20 years, I was recently surprized when I found an entry in an ayurvedic book that describes the slow process of making ghee (as described above). It then goes on to claim that ayurvedic grand poobahs believe that process burns off the cholesterol. It sounds odd to me, and I thought I would ask you guys for clarification. I am looking for the Alton Brown method for clarifying butter. Normal heating process, but he mentions something about allowing it to cool in the fridge overnight and I swear he mentioned something about adding water so everything separates. He had it in a bowl and basically said that the hockey puck was a nice way to have it stored for ease of use. Now I found the ghee recipe, but it's not it. There's a cooling step. Or am I just way off base here? Oh and one more thing, how to you make lemon butter without breaking the consistency? Melt a pound of butter in a heavy saucepan over low heat and slowly cook until the bubbling ceases and the liquid turns clear, 30-40 minutes. Strain and cool, being sure to leave any solids in the bottom of the pan. Or, once the butter has cleared, remove from heat and add two inches of hot tap water. Since it's less dense than water, the now clarified butter will float to the top. And in a few hours in the refrigerator will solidify it into a big yellow Frisbee that you can lift out and use. Use it immediately or wrap in wax paper and refrigerate or add foil and freeze it for up to 2 months. clarified butter is quite simply butter fat without solids. the straining gets you 99% of the way there. addition of water actually serves to provide a place for the odd left ofter bits to settle. without the water at the bottom (of the bowl) any congealing solids would be inside what is the "floating" layer. lemon butter: it's an emulsion. whip like crazy . . . I put 1 pound unsalted butter in a small crock-pot on low with the lid secured . Within a few hours the solids are on top. The butter is in three layers. Top: solids foamy, if cooked longer it will become crispy; middle: butter oil, clear and golden; bottom: a watery whey like fluid (I drink that -- has a mild buttermilk like taste). Spoon (skim) off the solids on top into a separate bowl, I give mine to my dogs (they especially like it when its crispy). Using oven mitts, slowly pour the butter oil through a fine mesh strainer (like a tea strainer) into a heat safe container, glass is best. This will catch bits of solids that may have been missed after skimming. STOP pouring before the lowest layer of liquid, which is not yellow, infiltrates the ghee container. Use or discard the liquid at the bottom. When the ghee (butter oil) has cooled, close the container tightly and enjoy the rich flavor ghee imparts to food. The longer the butter is in the crock-pot, the more water will evaporate off. I sometimes start the process in the morning before leaving the house for the day and finish when I'm back in the evening. This process does not require being very attentive, just don't put it on high; it will burn. One more thing: if you stir the contents of the crock-pot up, you have to give the mix time to resettle and separate out into the three layers before skimming off the solids and pouring off the ghee. Como la grasa utilizada para cocinar, la mantequilla proporciona un sabor �nico y aroma a muchos platos. El problema con la mantequilla es que antes de llegar a su humo punto, los s�lidos de leche se han ido Browning pasado a la combusti�n. Extracci�n de la s�lidos de la leche y las impurezas que nos permite mantener la mayor parte del sabor de la, mientras que la mantequilla de poder cocinar a altas temperaturas. Mantequilla sin s�lidos de la leche se llama mantequilla clarificada o elaboraci�n de mantequilla (aunque algunos restaurantes sirven s�lo mantequilla derretida establecido, mantequilla). El proceso de (aclaraci�n de la mantequilla) es bastante simple. Aclaraci�n de la mantequilla es tan simple como mantequilla derretida y dejar que la leche s�lidos se asienten o aumento de la grasa. Se debe impedir que tarda mientras se calienta la mantequilla, as� que utilizar una sart�n pesada que no tiene ning�n tipo de puntos de acceso (ver Materiales com�n de utensilios de cocina para obtener m�s informaci�n sobre hotspots). Cuando se utiliza la mantequilla salada, es dif�cil de adivinar cu�nto la sal se mantendr� en la mantequilla clarificada. Mucha de la sal se puede encontrar en los s�lidos de leche, ya que se instala o espumas, pero el importe exacto ser diferente cada vez. Uso de mantequilla sin sal para eliminar cualquier incertidumbre (puede agregar sal a la mantequilla clarificada despu�s de lograr la deseada salinidad). En este punto, puede eliminar la mantequilla por el calor y la capa superior de descuento en todos la espuma. Deje que la mantequilla se enfr�e un poco para permitir que varios de los s�lidos se asienten y luego vierta o una cuchara la grasa aclar�, dejando el resto de la leche s�lidos en la sart�n. Alternativamente, se vierte la mantequilla derretida caliente a trav�s de una gasa para filtrar la espuma y s�lidos que se han asentado, la captura de la mantequilla clarificada en un frasco. O bien, vierta la mantequilla en un recipiente caliente, deje que se aparte, mientras que de enfriamiento y luego refrigerar. Despu�s de que se ha solidificado, se puede f�cilmente raspar la capa de espuma endurecida de la rigidez de mantequilla clarificada. A pesar de mantequilla clarificada puro no tiene por qu� ser de refrigeraci�n, que recomendamos guardar la mantequilla clarificada en la nevera (un poco de leche s�lidos puede estar a�n presente y puede causar la mantequilla para ir rancio). Usar la mantequilla clarifi cada como lo har�a el uso de mantequilla regular (una cucharada decucharada) en las recetas. I like to clarify butter in a double boiler - takes a little longer but no risk of burning. I use a conical paper filter (Melitta type) in a metal funnel and strain the clarified butter into a glass jar. I have found that Paul Newman's salsa jars are just the right size for the amount of clarified butter you get from melting a pound of regular butter. This is such a great site! I was wondering if anyone had experience or read about adding herbs, medicinal or not, to clarified butter. I know the Indians add some stuff to their ghee while it cooks and Ayurvedic practitioners I believe add medicines into it. It's hard to find this info tho. If medicinal substances are added, when is the best time to add them: as the butter cooks or afterward after it cools and separates? Should the herbs be filtered out or not? What is the actual process of the butter oils extracting the medicines and how it is different from the water and alcohol extractions when making standard tinctures? I assume that the fat-soluble substances in herbs will naturally get into the butter, but what about the other ingredients: minerals, vitamins, proteins, etc? Will they all be lost with the water? What is the comparison of alcohol and oils as far as their solvent properties are concerned? some flavor / "other" compounds are soluble in water, some in alcohol, some in fats/oils. which solutes in what is not a 'all for one and one for all' situation - some specific compound will be extracted faster / sooner / more / less better so than in another diluent. research polar vs non-polar solvents, for starters. by and large, medicinal or culinary, either you use the right solvent or you don't get the results you want. how to . . . hot/cool . . . strain / don't strain . . .
the problem is not so much how to but an issue of safety. anything that has been growing the dirt/soil has the potential to be contaminated with botulism spores. short of using a pressure cooker to get the temp above 240'F - keeping / storing homemade extractions / diffusions is dicey business. keep refrigerated, keep no longer than two weeks. I saw on youtube a guy making clarified butter. I tried it and its works great! Just take your melted and cooked butter, pour it when the temp is about 140 F into a ziplock bag. poke a hole in one corner of the bag, hang it on one of your upper kitchen cabinet handles; tie to the handle. The butter, fat and milk solids separate in a few minutes. Poke a hole in the bottom of the ziplock back, drain the bottom stuff onto a paper plate then place a container under to catch the good stuff then move the paper plate to catch the rest of the bad stuff. So simple and easy! Michael, ghee will last for years. Don't know why you think it needs to be pasteurized; but perhaps I misunderstood. There are several posts in the clarified butter article that ghee and clarified butter are the same thing and I can tell you that is no-where near the truth. If clarified butter is to bread as ghee is to toast. To make ghee you start out just the same as for clarified butter, but after the butter is all melted you continue warming the butter until all the water boils out of the bottom layer. The evaporation process will cause a foam-up. After the foam subsides, you have no more liquid on the bottom of the pan, just milk solids. Keep heating. You will get a second foaming even higher than the first. When the second foam subsides you are done, remove the pan from heat. Cool to a manageable temperature and skim the foam from the top, then pour off the butterfat. all that will remain in the pan are the caramelized solids from the pan bottom. The butterfat itself will be golden brown, looking like it was toasted. It has a rich flavor that can not be achieved with any other fat I know. I don't know how long ghee can last, in my house we keep it on the counter in a sealed glass dish and it never lasts more than about 2-3 months before it is used up, and it has never tasted rancid. Unlike clarified butter, you'll want to go lightly when spreading ghee on toast or applying to other foods, it is a VERY rich taste that can overwhelm.